When summer “unofficially” ends and the kids go back to school, Massachusetts’ historic coastal resorts beckon as an ideal couple’s getaway – especially midweek when incentive rates make even the priciest properties quite affordable. Here are four seafront luxury resorts where romance blossoms as the leaves begin to fall. The White Elephant This landmark 1920s resort, located on the harbor in Nantucket (shown above; courtesy of Nantucket Island Resorts), is ideal for couples who want a low-key ambience with easy walking or biking into the island’s postcard-perfect town, where boutiques and eateries offer up wool sweaters and creamy clam chowder to ward off the evening chill. Sunlit rooms have cheery ivory décor with elegant sea-inspired touches while the Brant Point Grill serves steak and seafood with a harbor view. Weekday rates start at $265/night in late September and $195/night in mid and late October. The Wauwinet Nantucket’s other premier resort is decidedly more secluded, tucked amid the dunes with tranquil Nantucket Sound on one side and the restless Atlantic on the other. 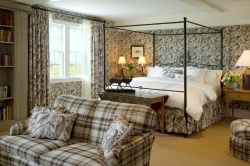 Romantic flourishes abound, from the antique- and chintz-decorated rooms (shown at left; courtesy of Nantucket Island Resorts) to the intimate Spa by the Sea. The resort’s Relais & Chateaux-worthy restaurant, Topper’s, serves a gourmet prix fixe or à la carte dinner with artfully-prepared local dishes such as baked Nantucket lobster tails and “untraditional” lobster bisque. Rates fall to $375/night on certain weeknights in September and $225/night for most of the first three weeks of October. Chatham Bars Inn Sprawled along the breezy waterfront just outside the charming Cape Cod town of Chatham, this 217-room inn with its curved veranda (shown at right; courtesy of Leading Hotels of the World) is a lovely spot to unwind – especially if you crave spa time. While décor in the circa-1914 main inn and dozens of spacious cottages is New England seaside charming, the distinctly Asian-inspired spa is a sleek oasis offering ocean-centric treatments with couples in mind. The 12 luxurious new Spa Suite accommodations with fireplaces and hydrotherapy tubs are a cozy option as the weather chills. Midweek rates begin at $395/night in September and $335/night in October. 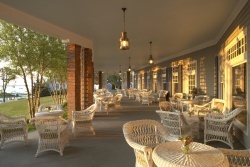 Harbor View Hotel & Resort Opened in 1891, this 114-room Martha’s Vineyard resort set amid the seafront homes of New England whaling captains in Edgartown has undergone a multi-year renovation that is restoring it to its past glory – with all the modern amenities. Casually elegant room décor (shown at left; courtesy of Harbor View Hotel & Resort) is accented by wireless Internet and L’Occitane toiletries, while Water Street, the resort’s Victorian dining room, features Vineyard-sourced cuisine. The shops, galleries and restaurants of Edgartown are just a short stroll away. Midweek rates in late September start at $230/night and drop to $170/night in October. Start planning your next getaway with your next getaway with our Romance Travel Deals. For general trip-planning info, see our Nantucket Travel Guide, Cape Cod Travel Guide, and Martha’s Vineyard Travel Guide.